The zebra’s natural habitats are the mountain, grassland and savanna regions of Africa. These animals have adapted well to life in these regions, particularly when it comes to defending themselves from predators such as big cats. In the wild, zebras can expect to achieve an average life span of 20 years because of their unique adaptations. Stripes for camouflage, long and powerful legs for running, and strong teeth adapted to a grassy diet are among the most important adaptations of zebras. Zebras have legs that are long and slender but very strong, enabling the zebra to run up to 40 miles per hour to escape predators. In addition, the zebra is nimble enough to evade predators or to kick them at close range. In fact, the zebra can use its hooves to deliver a kick capable of injuring or even killing an animal as large as a lion. Zebras are herbivorous animals with a diet comprised of thick grass and tough grass stems. The zebra's strong upper and lower incisor teeth are adaptations that help the it to break down these plants, enabling the animal to shear and chew effectively. Zebras also use their teeth to establish social bonds by grooming each other; and when threatened, they can inflict powerful bites. The pattern of a zebra’s distinctive black-and-white stripes differs from individual to individual. However, zebras from the same species and the same geographical area often share similarities in stripe patterns. These stripes are useful for defense purposes. 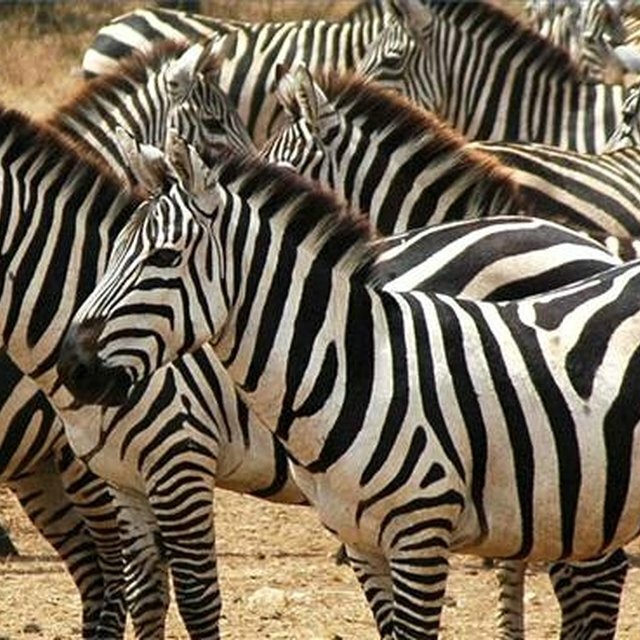 The striped markings make it difficult for predators to target individual zebras in a large herd. Stripes also blur a zebra's image as it runs from a predator. Three species of zebra exist. All three species feature black-and-white stripes, long, slender legs and strong incisor teeth. Size, marking patterns and skills vary slightly to reflect the evolution of each type of zebra within its unique habitat. Plains zebras are adapted to grassy habitats, while Grevy’s zebras can survive in arid regions; mountain zebras must climb well to survive in mountainous habitats. Grevy’s zebras are endangered, and mountain zebras are listed as vulnerable by the IUCN, but plains zebras are still relatively abundant in the wild. Ames, Hayley. "What Are Three Adaptations of a Zebra?" Sciencing, https://sciencing.com/three-adaptations-zebra-8561920.html. 19 April 2018.